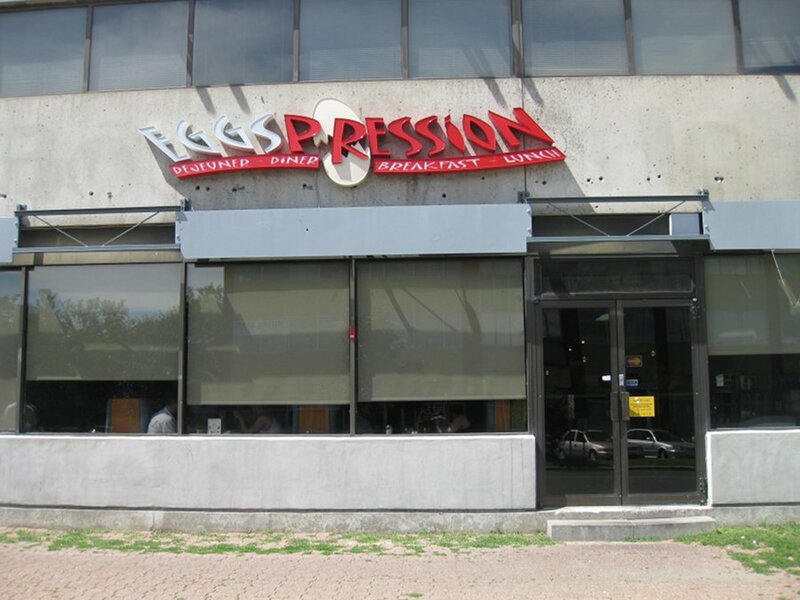 When you pull up to Eggspression, you immediately notice its very ample parking in the back as well as its side entrance. You could almost miss it from St Johns if you did not know where it is. This place is open every day of the week and early as well; weekdays have go from 6am to 3pm and Saturday to Sundays go from 7am to 3pm. When you walk in, you notice the place is not that fancy and some things are a little worn with age but at least the washrooms are ok. The layout has lots of tables and chairs and a fairly open dining room up front. When it’s a sunny day, the natural sunlight makes it shine nice and bright. 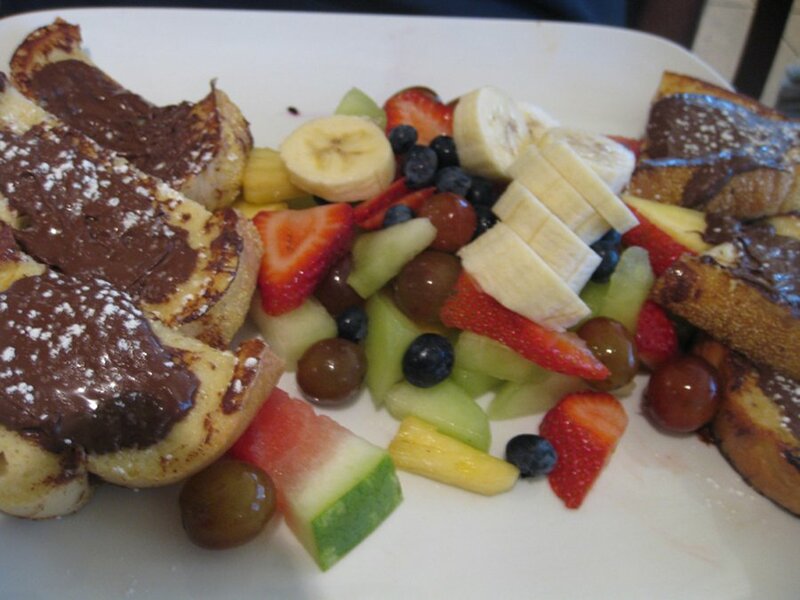 My friend started by having the choco-noisette French toast ($10.50) which came as 3 slices of French toast cut in half , drizzled with Nutella, topped with sugar with a mound of fruit on the side. This dish is actually a good deal considering the price as you get a large serving of French toast and a hefty portion of Nutella. The Nutella can be a lot to handle if you do not have a sweet tooth. The Nutella made me happy and I did not feel that the powdered sugar was needed. Coffee was included; although I was not a fan of it. Unfortunately I was unable to sample the Bacon Mediterranean omelette ($8.75) and the Bagel Santé ($8.75) at our table but the size of the omelette was impressive but I felt there was too much white space on the plate with the bagel and cream cheese. The omelette came with fruit and potatoes, which were tasty, but I felt there were more potatoes in the choco-noisette dish. 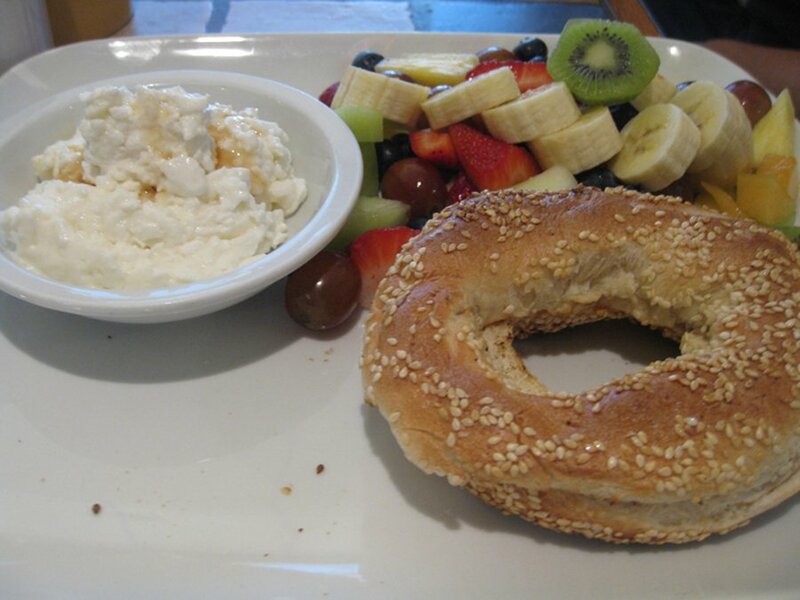 The bagel cream cheese plate came with fruit as well although something was missing. If you look a the picture there is a spot in the bottom left where a small yogourt could have gone or maybe potatoes or more fruit even. I just felt something was missing. 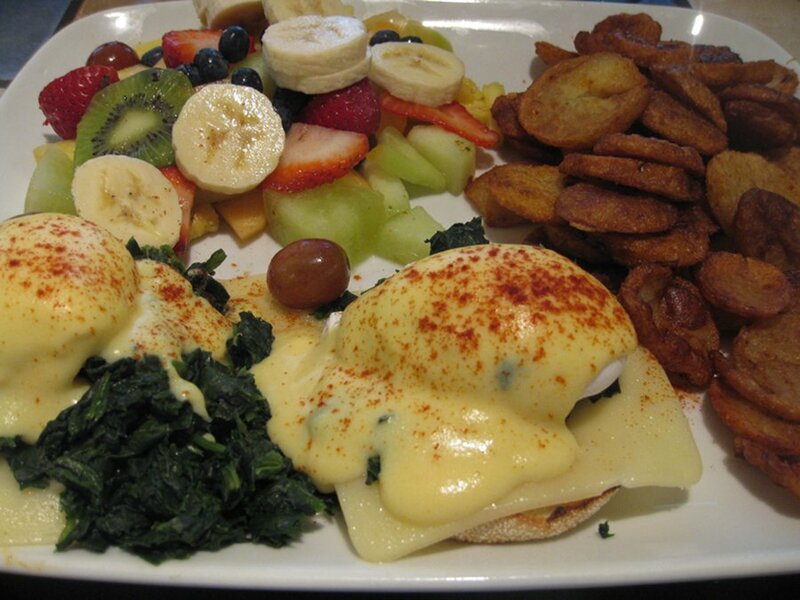 My dish, of course, was the eggs benedict Florentine ($9.95). It came as two poached eggs with spinach cheese, hollandaise sauce, a generous fruit portion and potatoes. 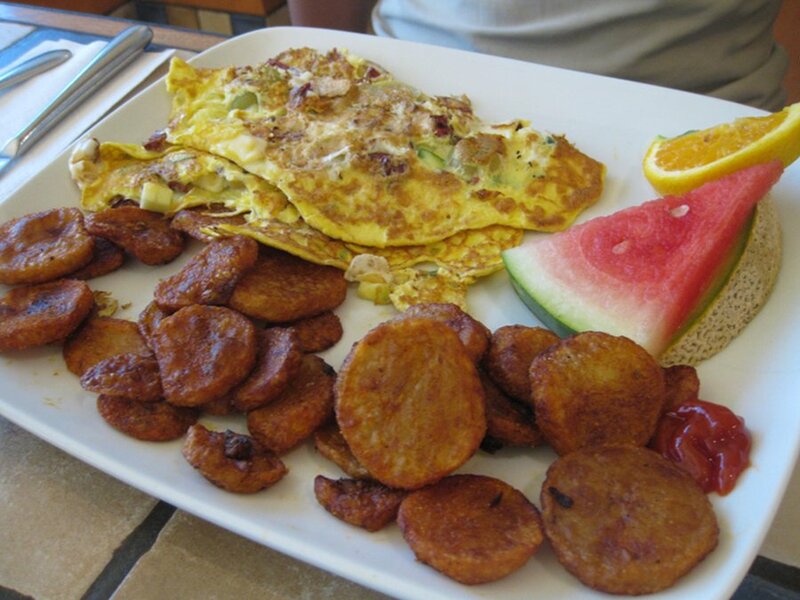 My plate was good as the potatoes were yummy and the fruit was very generous. The hollandaise sauce was ok and the spinach actually tasted much better than it looked. There was a cheese slice under the eggs but it was visible and I would have liked it all melted in and hidden. I felt that this dish gave you plenty for a good price. Overall, the presentation could have been refined but the taste and portion size did not disappoint. Our waiter was decent and the coffee refills were frequent and they were helpful with the menu. The menu is so large that you can get some choice in terms of vegetarian options. They also have a large health section with 7 items, which is nice to see considering that lots of people are health conscious. Decent prices, fairly generous portions, plenty of choices, and ample parking are a couple of highlights from Eggspression. Basically, this is your one-stop shop for morning food. The fact that it is open early, has a kid’s menu and you can order pretty much any breakfast dish makes this place score some points. The décor is a bit dated and worn out and the presentation of the dishes could use some refinement, but other than that it gets the job done at a good price. Just a correction for your review. There is wheelchair access — the restaurant has a second entrance at the other end. From the parking lot, you enter the main building, then there are sliding doors from the corridor. There are several regular customers who are in wheelchairs and this is the way they enter. Thanks for the clarification, I did not see that entrance last time, as well, do you know if there is a wheelchair accessible washroom? Yes, one of the two washrooms is.